Sardinian food online and Italian delicacies | Mullet roe and saffron fregola. Mullet roe and saffron fregola. With the festive season upon us, the Cuccureddu family are busy at the deli and in the Newhaven and Sardinian offices...but there is always time to think about the menu for Christmas lunch! After unveiling the key ingredients over the past week, we are finally ready to share with all of you Chef Lello’s very own mullet roe and saffron fregola, a blend of rich flavours and ancient traditions. The preservation of the authentic traditions as well as healthy eating and lifestyle matter greatly to us. Chef Lello lovingly creates every recipe, selecting only natural top-quality ingredients. Fregola pasta: fregola is one of the most typical Sardinian pastas, reminiscent of cous cous. Its origin is unknown, but it’s believed it was imported to Sardinia from the North of Africa by Genoan sailors. The making process is time consuming, yet it’s traditionally still made by many Sardinian families. After making the dough, small pieces are worked into small balls, laid down on a cloth to dry and then finally toasted in the oven. Grey mullet roe: this is another Sardinian specialty made from dried mullet eggs. It has always been a staple for Sardinian fishermen, but nowadays its value has grown so much and grey mullet roe is considered one the most appreciated luxury food in Italy. In fact, it is usually referred to as “Sardinian Caviar”. The eggs are first left to salt for 5 hours, then washed and left to dry in the wind for about 10 days. Saffron: the red gold of Sardinia, it is also called the “good mood spice” for its beneficial properties for psychological wellbeing. Saffron seeds are planted in September and the flowers are usually hand-picked in autumn. The production process is long, meticulous and completely artisanal as stigmas are very delicate. It takes 150 flowers just to produce 1 gram of saffron. In this recipe, Lello uses the Vermentino wine from Deriu vineyards. Other essential ingredients are: 1 garlic clove, ½ an onion and extra virgin olive oil. Bring water to boil in a saucepan. Meanwhile, finely chop the garlic and onion, pour 4 tablespoons of Corax extra virgin olive oil into the pan and heat it, add the chopped garlic and onion and leave it to golden. Pour 420 gr of fregola pasta in the boiling water with a pinch of sea salt. Don’t put too much salt as the mullet roe, being cured, is very salty. Open the grey mullet roe and cut it into small slices, drain the fregola after 8 minutes and mix it with the olive oil and garlic, onion in the pan. Save a bit of the water to blend all the flavours together at the end. 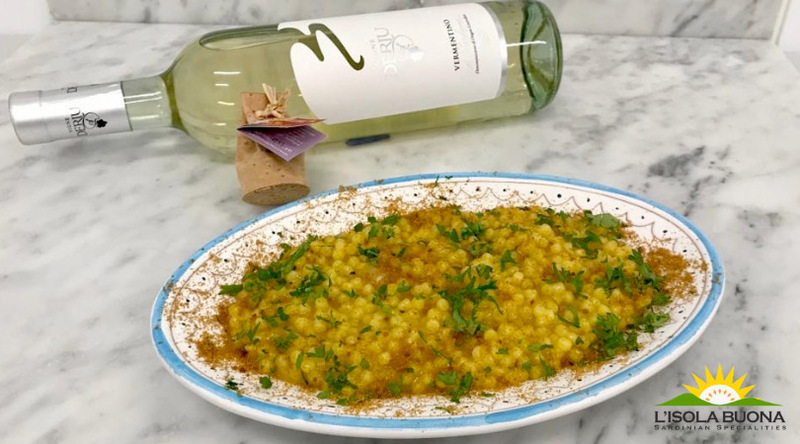 Dissolve a sachet of saffron in a glass of boiling water and pour it over the fregola, add the sliced mullet roe and stir until all the ingredients are blended into a creamy texture. Add some raw extra virgin olive oil and some grated bottarga according to your preferences. Garnish with fresh parsley and serve. We hope you like Chef Lello’s Christmas recipe. You are all more than welcome to try it at home and tag us on your pictures on facebook and Instagram. We wish you all a great festive season!